Care For Your Core With Green Juices, No Fruit (just lemon!)... Our Deep Detox Cleanse. For my seasoned cleansers, here is the green juice detox cleanse for you! Looking for a deeper, greener, no fruit juice cleanse experience? The Core Green Detox cleanse offers 48 oz of green juice each day. 3 different varieties of green juices, no fruit sugars (just lemon), and no nut milks. Instead, we have added our rich veggie broth to give this detox cleanse a little warm and savory. A Deeper Detox Cleanse Experience. This more green juice detox cleanse is a practice that brings you one step closer to fasting. The absence of natural fruit sugars and nuts from this cleanse allow the body's core detoxification systems to run their clean-up processes in a restful state. This cleanse supports the digestive system by providing easily absorbed plant-based nutrients from their whole food source - fresh, organic, green vegetables. 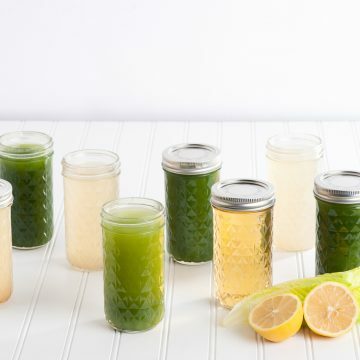 The addition of the veggie broth adds a richness and warmth to the otherwise cooling green juices in this cleanse. Who Should Try Our Green Core Detox Cleanse? This cleanse is for my experienced cleansers who have CAN CAN'ed before and would like to explore the next level of cleansing and detoxification. A full departure from food. Please contact Teresa if you have questions about if the Green Core Detox cleanse is right for you.